In the Worlds of 1 Spatial Dimension article, I wrote about various one-dimensional worlds (the Income Line, the Rainbow Line, and the Aeolian Line) — all of them involving dimensions which are not themselves physical dimensions of space. What is the distinction between a general dimension and an honest-to-goodness spatial dimension? In short, what do we mean by saying that a dimension has something to do with physical space? In a sense this is an elementary question with an elementary answer, and some of you who feel more comfortable with these concepts may find yourself bored by what I’ll say below. But one of the interesting things is that the obvious answer that will be given in this article turns out, in a more sophisticated setting, not to be quite correct. By the time we get to the wonderful subject of how quantum field theories and quantum string theories are related to each other, we’ll discover the answer I’ll give below no longer suffices, for a very tricky reason… So read this through, but don’t dismiss it as too obvious — because down the line some very non-obvious things can happen. Perhaps the best way to understand this is to compare and contrast a bit. (You may want to have the Worlds of 1 Spatial Dimension article available, since I refer back to it; click here, and it will open in another window.) Let’s think about the rainbow line (see Figure 2 of the 1-dimension article.) What makes it not a spatial dimension? Fig. 1: Two flashlights, black and white, emit green and blue light, as represented as black and white points located on the rainbow line. As the color emitted by the white flashlight is dialed from blue to yellow, the two points on the rainbow line collide and pass each other with no physical effects. Suppose, for example, that I had two flashlights that can emit light with adjustable color. 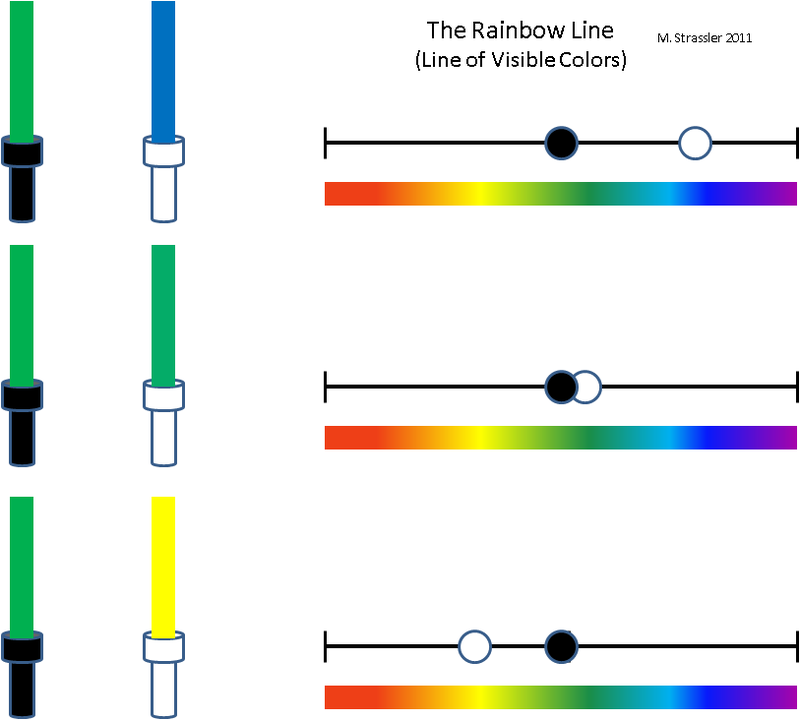 Each flashlight’s emitted color can be represented as a point on the rainbow line; in Figure 1, I’ve represented the color emitted by the black flashlight as a black point on the rainbow line, and that of the white flashlight as a white point. Let’s say the black flashlight emits green light while the white one emits blue. And now let’s take the white flashlight and gradually adjust its color until it emits yellow, as shown in Figure 1. At a certain moment, the two flashlights will have the same color — as points on the rainbow line, they will come into contact. Does anything happen when that occurs? No, obviously not. 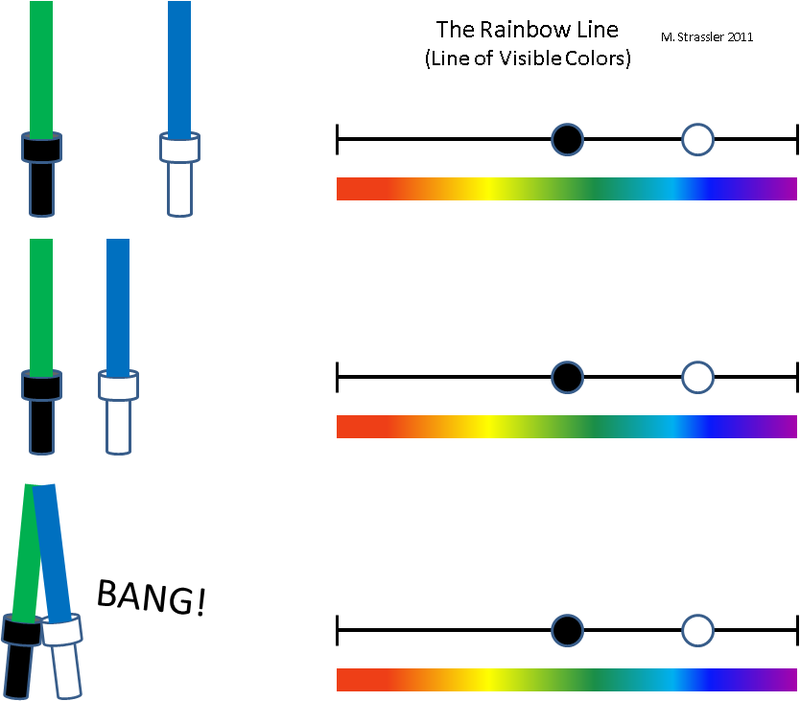 When the two points on the rainbow line come close, there is no physical effect on either flashlight. They can pass each other without any collision, or even a greeting. Contrast that to what would happen if, as in Figure 2, I left the colors alone but tried to move the white flashlight from the right of the black flashlight to its left. Obviously, when they come too close, they will collide — there will be a noise, both flashlights will be jostled and perhaps even dented, and their motions will change. This is true even though they are at different points on the rainbow line! Fig. 2: As in Figure 1, but now the colors of the emitted light are left unchanged and the flashlights themselves are moved. When they attempt to pass each other, a collision occurs, creating noise, changing the motion of the flashlights, and perhaps even causing damage. This is true even though their colors are different --- even though they are "located" at different points on the rainbow line. Intuitively, the space in which the flashlights as physical objects are located is the physical one. In a physical space, there are notions of near and far, and consequences of nearness, that matter. Two objects far from each other in a physical dimension will not affect each other to the same degree as two objects that are near. At the very least, two objects that are close together will pull on each other gravitationally with greater force than if they are further apart. If the objects are what we think of as “solid”, then electrical forces within their atoms will prevent them from moving through one another. There’s no analogue to these sorts of effects from making their emitted light the same color… because although the rainbow line is a dimension that is useful for representing what colors are being emitted, nothing of importance actually happens there. Another example: two people with two different incomes can be represented as two points on the Income Line. If one gets a raise and passes the other, there might be a psychological impact, but not a physical one! But two tight-rope walkers on a high wire (see Figure 5 of the 1-dimension article) cannot pass each other; it is physically impossible because of the forces that develop when they are too near to one another. Said another way: you can kick someone who is next to you even if he or she makes 100 times more money than you do; but you cannot kick a person 100 kilometers away even if you make the same amount of money. In a physical spatial dimension, notions of near and far are vitally important in a way that they need not be for more general dimensions. More formally, physicists refer to this as the property that physical effects occur locally in space. There are many subtleties with this concept and it deserves an article of its own. [Quantum mechanics, for instance, significantly complicates and enriches this notion — but does not overturn it.] Moreover, this is not the whole story: there are other things that contribute to making a space physical. But I think this observation will do, for now. The reason I’ve made such a big deal out of this (apparently) simple concept is that when people talk about Extra Dimensions as something that the world might exhibit at the Large Hadron Collider, they really do mean Extra Spatial Dimensions — dimensions that share this property with the dimensions that we can see, that physical effects are local in those dimensions. It’s not just extra dimensions of any old sort. And that’s very important in predicting the implications of those dimensions for experiments! I’ve been asked by a non-expert if thought is a dimension. Another said to me that she believed that emotions are obviously just as important dimensions of people’s lives as space and time. Well, these statements aren’t really false; a psychologist might be able to describe some aspects of thought or emotion as taking place within some sort of dimensions. But one would need to remember that these dimensions are qualitatively different from the physical dimensions that physicists refer to. You and I may think the same thought, or share an emotion, without injuring each other; but please, no matter what you are thinking or feeling, I’d really appreciate it if you would avoid stepping on my foot! There should also be Clifford’s view that space should contain all its subspaces, as is the case for 3-space and space-time, which pretty much requires physical space to make algebraic sense. I figure that if we can make sense of particles, then the geometrical structure will take care of itself.